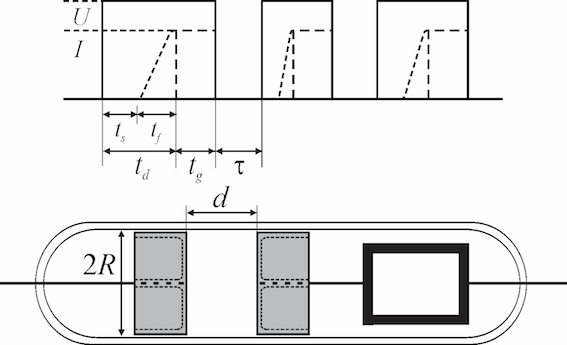 Measurements of the formative time delay t_f at different working voltages U in argon at low pressure are presented. The well-known decreasing voltage behavior of the formative time delay is theoretical described by different empirical and semiempirical models. In addition to introduced empirical models, some models from the literature are applied to elucidate experimentally obtained t_f(U) dependence. However, the models from the literature show a good agreement with the experimental data only at low overvoltages \DeltaU (\DeltaU=U-U_s where U_s is the static breakdown voltage). Therefore, empirical corrections are made based on data analysis, and good compatibility is achieved in a whole range of working voltages. Chapman, B.N., 1980. Glow discharge processes: sputtering and plasma etching, John Wiley and Sons, New York. Fridman, A., 2008. Plasma chemistry, Cambridge University Press, Cambridge, New York. Gänger, B., 1953. Der elektrische Durchschlag von Gasen, Springer-Verlag, Berlin. Lieberman, M.A., Lichtenberg, A.J., 1994. Principles of Plasma Discharges and Material Processing, John Willey & Sons, New York. Makabe, T., Petrović, Z.Lj., 2006. Plasma Electronics: Applications in Microelectronic Device Fabrication, CRC Press, Taylor & Francis Group, New York. Marković, V.Lj., Gocić, S.R., Stamenković, S.N., Petrović, Z.Lj., 2005. Physics of plasmas, 12, 073502-1-8. Meek, J.M., Craggs, J.D., (Eds. ), 1978. Electrical Breakdown of Gases, John Wiley & Sons, Chichester, pp. 655-688. Mesyats, G.A., 2005. Pulsed Power, Springer, New York. Raizer, Yu.P., 1991. Gas discharge physics, Springer-Verlag, Berlin. Raju, G.G., 2006. Gaseous electronics: theory and practice, CRC Press, Taylor & Francis Group, Boca Raton. Stamenković, S.N., Marković, V.Lj., Jovanović, A.P., Stankov, M.N., 2017. Romanian reports in physics, 69, 408-1-16.